Did you know that sleep can be a benefit to your homeschool? I’d been a homeschooling mom for twenty years when I was forced to have kids in the public school system. I say “forced” because we had kids in foster care and DHS would not let me homeschool them. So for the first time ever I filled out paperwork and had to figure out the schedules of three different schools. During this time I was homeschooling three children at home. And our new daughters were between the ages of 11 and 15-years-old. Suddenly I had kids in homeschool, elementary school, junior high and high school. There were many challenges. I had to figure out how to help kids with homework and how to communicate with various teachers. We had to figure out school lunches and schedules, but by far the hardest thing to deal with was my kids’ lack of sleep. You see one of the benefits of homeschooling is allowing my kids to sleep in. On most days my kids wake up around 8:00 a.m., and we start school around 9:00 a.m. This is a far cry from what we’d experienced when they went to public school. I usually had to wake them up around 6:15 a.m. and had to get them to school by 7:40. The mornings were chaos with everyone getting dressed, making lunches, and fighting. There was a lot of fighting because it was a big hassle to get everyone out of bed. My kids were extremely tired because they often came home with homework. Sometimes we stayed up late finishing it. And on days when they finished homework before 8:00 p.m. we tried to squeeze in family time by hanging out. After all, we hadn’t seen our kids all day. Because my homeschooling kids finish all their schoolwork during the day there is no homework at night. We have dinner together and participate in taekwondo. Then we hang out and everyone goes to bed at a decent hour. And then, they get to sleep in. With this schedule, my kids get 9-10 hours a night, which is what they need. Years ago I was interviewing a doctor, and she told me that most of the problems that parents have with tweens and teens have to do with lack of sleep. Teens are staying up too late and waking up too early. Because they are growing so much, tweens and teens actually need the same amount of sleep as toddlers. And when they don’t get it, they’re like a whole bunch of BIG cranky toddlers running around. I’ve found this to be true. 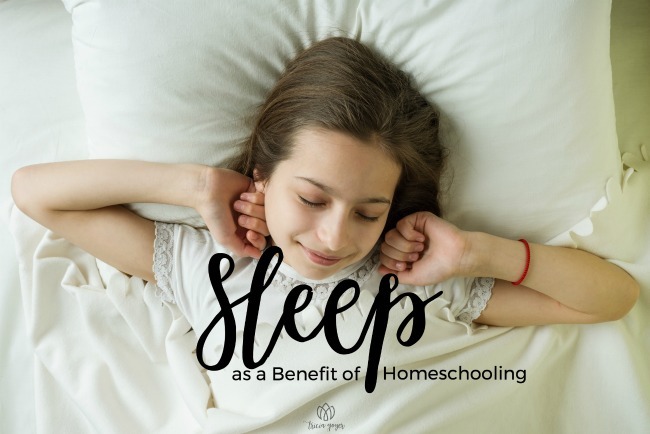 There are many benefits to homeschooling, and sleep is one of them. By the time we start school at 9:00 a.m. my kids are awake and ready to learn. We sit down with our Bible Study and our Sonlight Curriculum. There is no rushing out the door. There are no cranky kids … well, if they are it usually isn’t because of lack of sleep. And for that I am thankful. 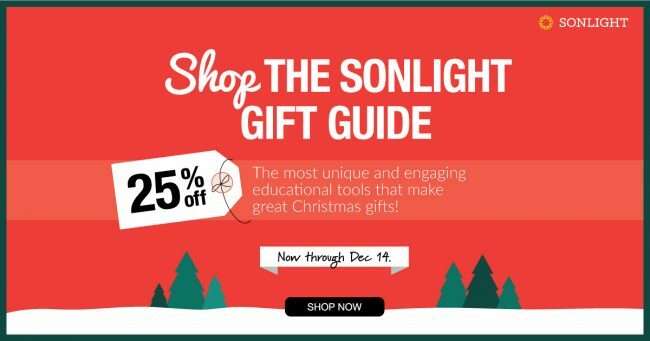 Shop the Sonlight Gift Guide and receive 25% off select items! Great post, I completely agree! We recently had the same situation and now that they are all homeschooled, there’s so much more peace in our home! I agree! But as mine have become teenagers, the struggle to get out of bed at a reasonable time has become overwhelming! They’d sleep till noon everyday if they could! Any advice on how to motivate these sleepy teens?! I wake my kids up between 8:00-9:00 a.m. IF they don’t get up when I wake them up, they owe me $5! I completely understand and agree!